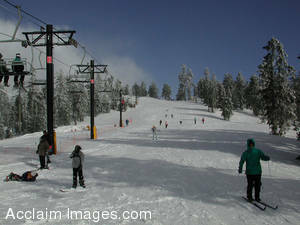 Description: Stock Photo of a Ski Slope on Mount Ashland in Oregon. This photo shows the busy ski slope with a ski lift, skiers, and snowboarders on Mount Ashland, Oregon. You may purchased this photo as an art print or a poster. You may also license it as stock photography.